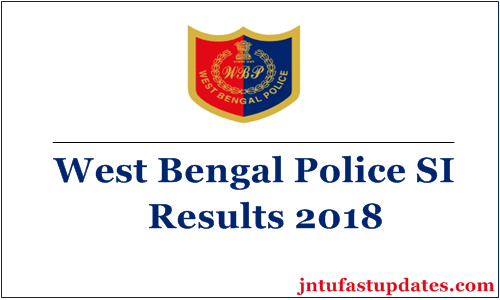 WB Police SI & Lady Sub Inspector Results 2018: West Bengal Police Sub Inspector written test was successfully organized by the West Bengal Police Recruitment Board (WBPRB) on 29th July. This written test was held in many examination centers across the West Bengal state. Candidates have competed in large numbers for the Sub Inspector posts. As per the reports, almost all the applicants have given the test for SI posts. WBPRB has released the answer keys after few days of the examination. Competitors have checked with the answer keys and estimated the probable score. The competitors who have come across the SI screening test and waiting for the results can check the result soon from the official website, policewb.gov.in. The organization will announce the cutoff marks, and merit list at the time of result. Aspirants can check the WBPRB official portal on a frequent basis to download the results. The West Bengal Police Department is the state level safety and security protection department; the department also offers various job opportunities for the people having the suitable eligibility criteria. It recruits candidates based on their performance in various rounds such as PET, PST, Written Test, and Medical Test rounds. Candidates clearing all the rounds will be given posting. This year the department has announced 1527 Sub-inspector and Lady Sub-inspector posts for various locations across West Bengal state. Thousands of hopefuls interested in getting the police SI posts in the state of West Bengal have sent the applications during the application process. The application process was held from 6th April to 5th May. Candidates who have applied for the West Bengal Police SI posts have initially attended for the written test round, which has been conducted on 29th July. All the hopefuls competed for the test can shortly download WB SI results 2018. More details about West Bengal SI results were given in this article. Aspirants competed for the WB Police Sub-Inspector/Lady sub-inspector examination can shortly download the results. The West Bengal Police Department is expected to release the result within 3 to 4 weeks of the examination (approximately). Hence the WB SI Police examination has been organized on 26th August, the result is expected to be released in the September (tentatively). Candidates have to stay patient until the organization announces the result date. West Bengal Police SI Cutoff marks will be announced at the time of results. The cutoff marks will be decided based on various factors such as the total number of posts, number of competitors, the difficulty level of the examination and other factors. Please enter your Application Sl. No , select your date of birth, Select Your District (other than West Bengal please select Others) and click on submit. On the homepage, the Police Sub Inspector Result link will appear on the screen. Click the link and enter the required details such as register number, etc. The result gets downloaded along with the score. when will be the resultbor 29th july's exame??? What is cut of marks of departmental candidate? How long wbsi of police result will be punish? 125.5 sc, can I called for next stage in WBP SI 2018?.